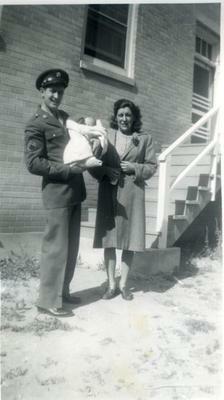 A man in a military uniform holds a child in his arms, with a woman standing next to him in a coat holding a thing of milk. They are standing in front of a brick building with stairs. “A Bushnell patient with his wife and child,” USU Digital Exhibits, accessed April 20, 2019, http://exhibits.lib.usu.edu/items/show/18752.